***UPDATE*** Apartment has been freshly painted with all new furnishings and decor. Better pictures coming very soon. The 3rd floor walk-up apartment is centrally located in Montreal. A bright & cheery apartment with complimentary coffee and other niceties make for a great place to stay - your home away from home. Rest assured that what you see here is what you get when you check-in. I've been hosting since Spring 2011. The apartment is owned by me as is the building. This apartment is being rented out legally. This 1100 sq. ft, newly renovated 3rd-floor walk-up apartment with 3 closed bedrooms is centrally located in the trendy Mile-End area Montreal - about 10-15 minutes from downtown. The apartment is flooded by sunlight, has comfortable furniture and two private balconies. Open the windows and feel the continuous summer breeze or enjoy the air conditioning. If you have any special requirements just give us a call and we will do our best to accommodate your needs. If you are celebrating a special day we will be happy to prepare a special welcome basket just let us know. You can easily contact me via VRBO message or text messages during your stay if you need any information. For emergencies text messages should be used. Street parking is available, in front of the apartment, at $3/hour, chargeable periods: Mon-Fri 9am-9pm, Sat 9am-6pm, and Sun 1pm-6pm. There is no parking on the side of the apartment on week days between 3:30pm-6pm and no parking on the opposite side from 6:30am-9am. Parking is available on side streets that do not have meters and do not require permits. Be careful with the city’s restrictions such as rush hour lanes, cleaning or snow removal schedules. Though Mile-End is a safe neighborhood be aware we are not responsible for any damage or theft done to the vehicles parked on the street. If you would rather just park your car and not use it during your stay there are parking lots nearby. Additional information is provided after reservations are made. The apartment is very centrally located. Mile-End is a highly multicultural district with a mix of Anglophone and Francophone populations and is known for its artistic neighborhood, home to artists, musicians, writers and filmmakers such as Adam Gollner and Plants and Animals, etc. There are many art galleries, designers’ workshops, boutiques and cafes found here. toilet, shower, No tub. Large shower. Heated floor. Large sky-light. Towels, shampoo/conditioner, soap and other niceties provided. Laundry room in apartment with full size washer. Detergent included. Street parking in front of apt, @ $3/hr, chargeable periods: Mon-Fri 9am-9pm, Sat 9am-6pm, & Sun 1pm-6pm. NO parking on the side of the apt on week days between 3:30-6pm & 6:30-9am across the street. FREE WIFI code is provided once you check in. Dishes, bake ware, pots and pans, utensils, glassware, etc. Keurig coffee machine - coffee pods supplied, tea, sugar, sweetner, etc. Paper towels, dish soap, tea towels, etc. Dining room table seats 6, can be extended to seat 8 by added the kitchen table to the configuration. One balcony faces the street and the second one is in a quiet courtyard. Chairs and table. The apartment is bright, clean and comfortable. It’s on a convenient bus route (#80) which makes it easy to get to downtown. Plenty of good restaurants in the area, and of course the best bagels in the city. Note that it’s a third-floor walkup, so the stairs will keep you fit. Montreal is an amazing city, and we thoroughly enjoyed staying at this apartment during our visit. Montreal has the feel of a college town but in a metropolitan city. It doesn’t feel too big or congested but has all the attractions of a big city like Chicago, NYC, or Boston. The apartment was clean and large and had plenty of amenities that made our stay enjoyable. There were five of us, but the place could probably sleep up to eight comfortably. We felt very much at home and were able to do all the things we would normally do at home, such as cooking, hanging out, and watching movies. There is washer and dryer, which meant we didn’t have to pack as much. The bathroom was modern and large and has a skylight window that brought in plenty of natural light. Street parking is available but you need to read the instructions carefully. We didn’t have any problem finding a spot and saw several non-Quebec license plates on the street. The apartment is next to a major street but the place was very quiet without the street noise. The apartment is conveniently located near all the major attractions, but there are plenty of places to visit even within the neighborhood. We had the best bagel ever from St-Viateur Bagel. The local butcher had great selections of high-quality meat. There were plenty of restaurants within walking distance. We even ran into an old friend at a local brewery which made our trip all the more enjoyable. Super place to stay . Ideal for discovering Montreal ! We spent some really lovely days in this flat. Nice neighborhood , all facilities nearby and excellent connections to the city center. The flat is very cosy and very well furnished. Felt like being home ! We definitely recommend it ! Lovely space, just as described. Ruth was very accommodating and responsive. Fun neighborhood! Comfortable space in a beautiful city. What a lovely place. Close to everything we wanted. Plenty of space for the family. Eminently affordable. I appreciate that this is a legal, licensed unit and I just hope no-one was evicted to make something like that happen. The apartment is very centrally located in Montreal. 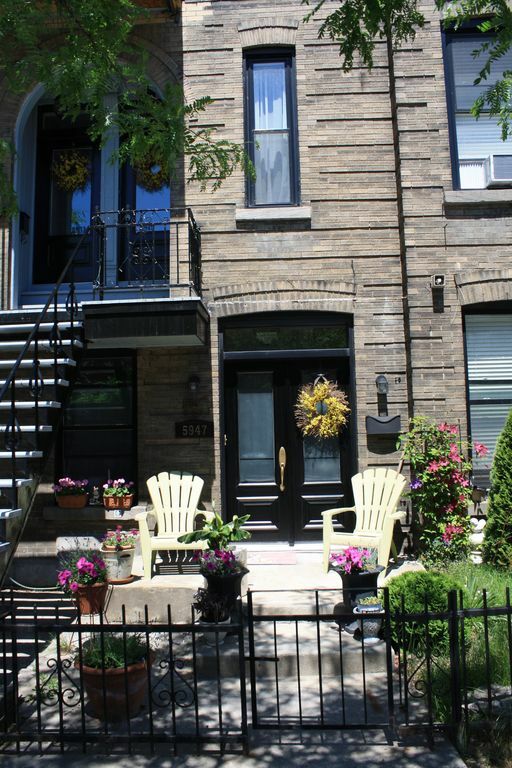 Mile-End is a highly multicultural district with a mix of Anglophone and Francophone populations and is known for its artistic neighborhood, home to artists, musicians, writers and filmmakers such as Adam Gollner and Plants and Animals, etc. There are many art galleries, designers’ workshops, boutiques and cafes found here. Great location for executives here for a limited weekly/monthly time period. Very close to all downtown offices. Steps to shops, grocery stores, pubs, bistros and restaurants. Mount Royal Park, Downtown, Old Montreal, Old Port, Olympic stadium, Insectarium, Biodome, Botanical Gardens, International Fireworks competition: Grand Prix June, International Jazz festival, Just for Laughs comedy festival, etc. YMCA 5 minute walk with daily pass. Many nearby parks and swimming pools. Parking: Street parking is available, in front of the apartment, at $3/hour, chargeable periods: Mon-Fri 9am-9pm, Sat 9am-6pm, and Sun 1pm-6pm. There is no parking on the side of the apartment on week days between 3:30 pm-6 pm and no parking on the opposite side from 6:30am-9am. Parking is also available on side streets that do not have meters and do not require permits. Groceries: There are plenty of places to buy groceries on du Parc and Bernard – they are all within walking distance from the apartment. Bagels: The famous Montreal bagel shop, St. Viateur Bagel, is located just east of du Parc on Saint Viateur. Open 24 hours. Public Transit: Apartment is steps away from buses and metros and centrally located to many attractions. Bus/metro tickets/passes may be bought at the convenience store located at the corner of du Parc and Bernard – northwest corner. Bikes: BIXI bikes are available a short walk from the apartment. BIXI is Montréal’s public bike system. It’s the bike that’s really an alternative means of urban transport. Taxi: 514-273-2435 Champlain Taxi Co.
No parties and no smoking. The customer must ensure the tranquility of the place in order to respect the neighbours and keep noise low after 11pm. At all times, the number of people in the apartment can not exceed the number specified in the reservation. No party nor reception are allowed on the premises. Ignoring these regulations will result in total loss of security deposit.